If you’re an entertainer or event vendor responsible for securing your own bookings, it’s critical that you possess the ability to initiate and carry out professional phone calls with potential clients. Fail to connect with the client during a call and chances are you’ll lose the lead. 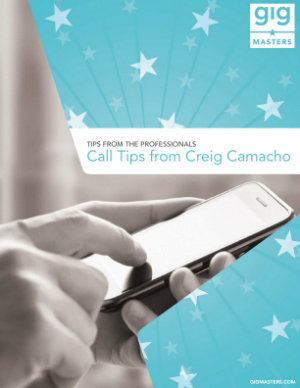 That’s why we turned to prominent GigMasters musician Creig Camacho for a few fool-proof tips on fielding successful business calls. - How to time the calls between your initial quote and follow-up. - How to rein in a client with the right facts about your service. - How to generate conversation that's both practiced and authentic. This Booking Guide gives you specific, actionable steps to help you improve your conversation skills with clients across the board. Get your free copy today! Copyright © 2013 GigMasters, Inc. All rights reserved.